Here’s our set list from Saturday night. It’s not really a set list because I forgot to write them in the order we did them. But there you go. It’s a fair representation of the songs we play. 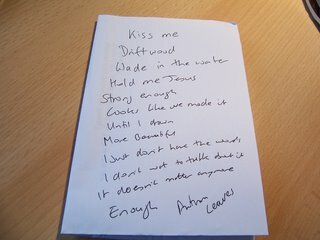 ‘More Beautiful’, ‘Enough’, ‘Until I drown’ and ‘I don’t have the words’ are all written by the lovely Steph B. You can read the lyrics here. The rest you can guess at.